In 1954, Bernard Baruch found the modern mentality increasingly evidencing fears concerning the future. Christians disagree on whether the Republican losses in the November elections were a blessing or a setback, because they initially differed on how to characterize the contest. When was the last time you sat down with your Bible for a few minutes with God’s Counsel and encountered a sentence or two that gave you a spiritual slap upside the head? 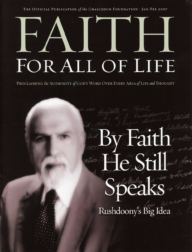 A half-decade has passed since the death of Rousas John Rushdoony, and by faith he yet speaks. This was a man who redeemed the time, and every paragraph from his pen reflects that consecration of every thing, beginning with every fiber of his own being, to the Lord God. We live in an age of unbelief. Our culture has abandoned its faith in God’s Word and has turned aside to idols. What Makes This Church Different? The founding of a new Christendom may seem a tall order for a denomination that lists only a dozen churches on its home webpage (www.rpcus.com); but all Christians know the parable of the tiny mustard seed that grows into the biggest tree in the field.